This is the second guest post from Deb Viney who works at the School of Oriental and African Studies (SOAS), University of London, UK. Her first post was From the back of the choir 1 — first steps which looked at her experience of joining the SOAS World Music Choir. In this post, Deb describes a typical weekly choir session. 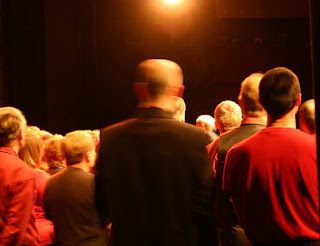 Chris was kind enough to ask me to contribute some thoughts about what it’s like to be involved in a natural voice style world music choir from the choir member’s perspective. The promise that there would be no auditions and no requests for anyone to sing alone was very important to me. Like lots of people I’ve previously been given messages suggesting that I “can’t sing”, but I still enjoy trying. In this kind of choir, that’s not a problem, I fit right in. I’ve no desire whatsoever to be a soloist, or in any way to draw attention to myself, so I always prefer to stand at the back of the choir for performances. Practice starts at 7pm on a weekday, actually people tend to drift in over the first 20 minutes or so … We form a big loose circle and the choir director starts with a physical warm up, shaking out tight muscles and a bit of stretching. No standing in prim rows, it’s shoes off and stand straight (in my case, at least for as long as I can stand!). Then onto some noise-making: sirens, humming, nonsense sounds, whatever the director suggests, really, sometimes we add the sound effects for a funny story. Then we might move on to some kind of vocal scales, perhaps in the form of a counting song, moving up and down the range of our voices — don’t strain, but reach as low or high as you can. It’s surprising, but the group manages to start sounding like a choir, even this early in the session. For a first song, the director will probably choose something very easy. It might be something silly, like a tongue-twister, or something we have practised often before. Or perhaps a simple piece that can be easily turned into a multi-part round (that’s where the choir is formed into many sections and each sings the same, but they start at different times, so the sound has many layers). The second piece might be some work on a more difficult song, in our case that’s usually something in a language other than English (more about that later). It’s usually best to do the toughest stuff before people get too tired. Usually we work by first all learning the tune, that provides a basic structure into which we fit the parts. Then the director teaches each section their part. She breaks down the part into shorter phrases and first we repeat them to try and establish the words and rhythm, then we start to sing them. It takes only a handful of repetitions of simpler songs to allow the people singing the part to get enough confidence to allow the choir to run through all of the parts together. In a typical session we might manage to fit in a refresher of one or two more songs we have learned before, maybe adding more verses or adding extra parts. So typically we cover three or four songs in an evening. This means that over the course of the Autumn and Spring terms (about 40 practice-hours) we learn a repertoire of about 10-12 pieces. Since the SOAS choir has about two-thirds new members each year (as many students move on) we tend to learn a new repertoire each year, though we might carry over one or two favourites. How do you learn songs in a language you’ve never heard before? The simplest answer is: by any means that works for you! Basic repetition works in the very short term, for example, to allow us to sing the part immediately after it was taught, but it may not be enough to allow us to remember a part from week to week. So apart from repetition, how do we learn? Most people use one or more of the basic learning modes: visual, auditory, kinaesthetic and semantic. In other words we might remember by associating the sounds with an image; or by associating the sounds of the song with a rhythm or with sounds we recognise (perhaps a foreign phrase sounds like a name, or a phrase in English). Another possibility is to learn by the movements (kinaesthetic links), how that strange sound feels as you say it, distinctive mouth movements. The other possibility is to find, or to assign, a meaning (semantic content) to the unfamiliar sounds. This can be through understanding the translation, but it can also be just a matter of attaching an arbitrary meaning to the sounds to help you to remember them. How do you remember all those songs??!! If this all sounds too much, don’t worry. I got through my whole first year as a choir member, including a performance, without properly learning any of the songs: my memory was blank until the director gave the first line as a cue. The second year was easier and this year I actually did learn in full several of the songs — which suggests that learning by ear does improve one’s auditory memory. So keep working on it!